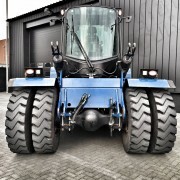 For sale and available from stock! 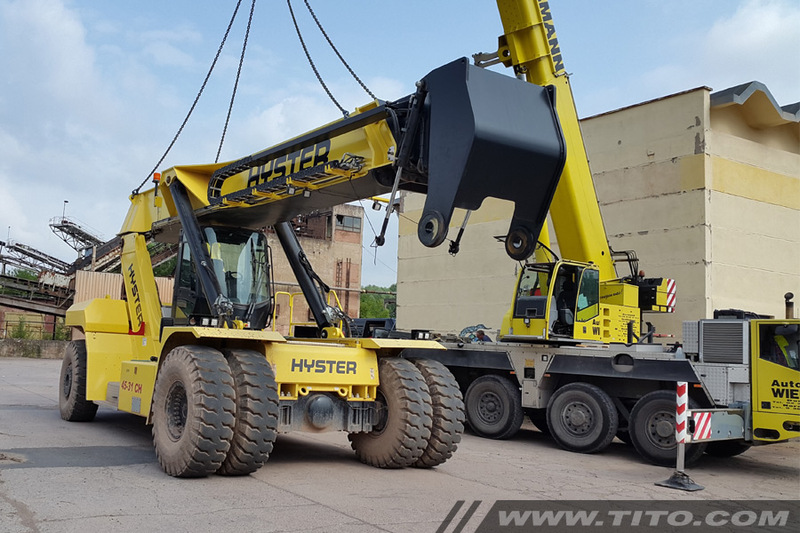 Brand new 32 ton Hyster forklift with a tire handler/manipulator to change the tires and wheels of the mining haul trucks. 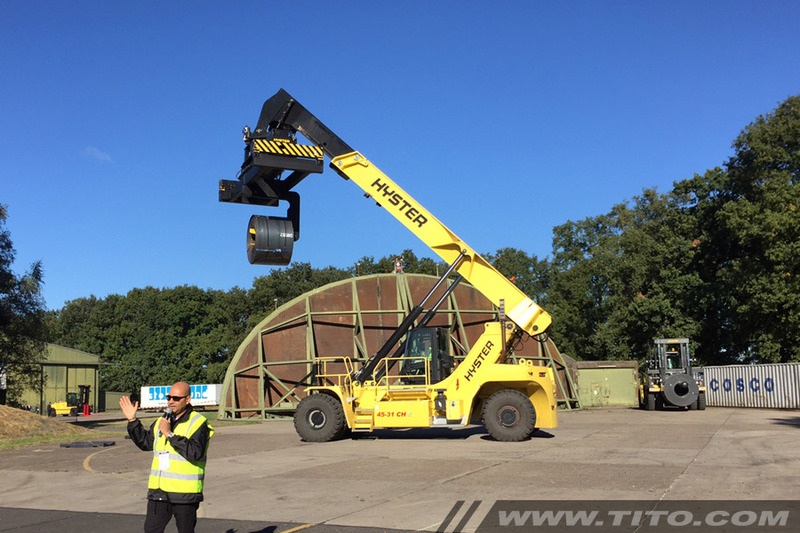 The basic forklift is a Hyster H32XM-12 with a capacity of 32 ton, equipped with a 16 km/h speed limiter and a hydraulic accumulator. 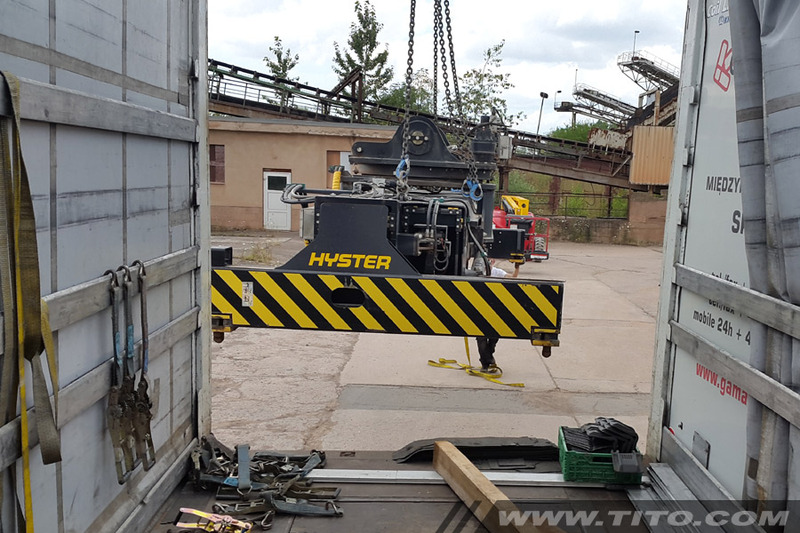 handler worldwide as a complete machine. 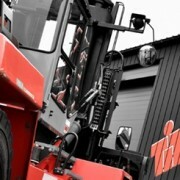 Besides that we can train your technical staff, supply spare parts and return on-site for maintenance or repair. 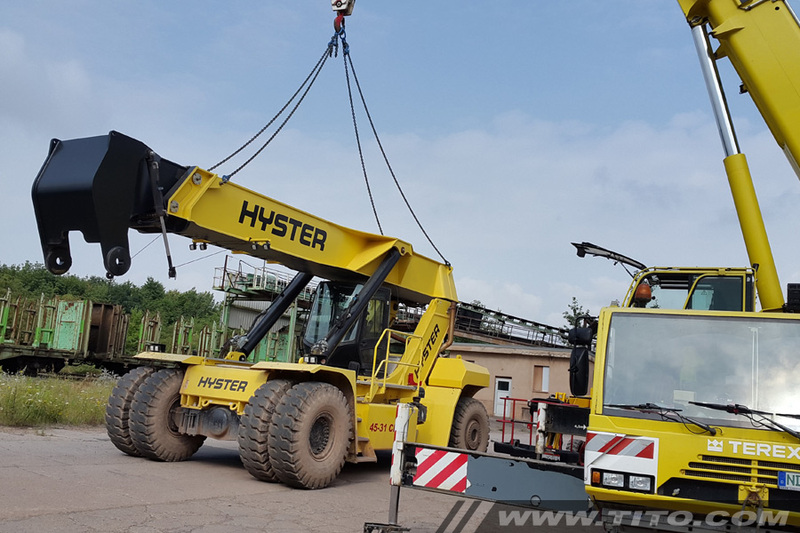 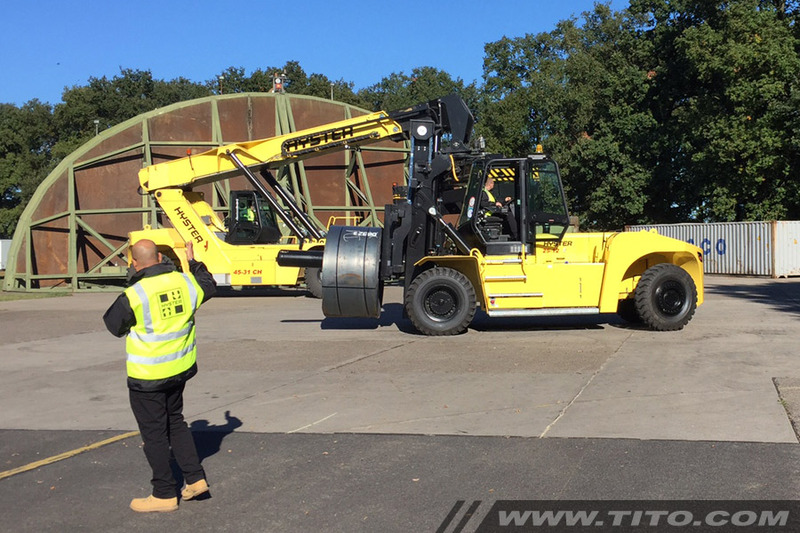 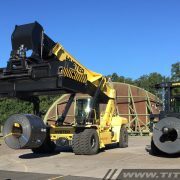 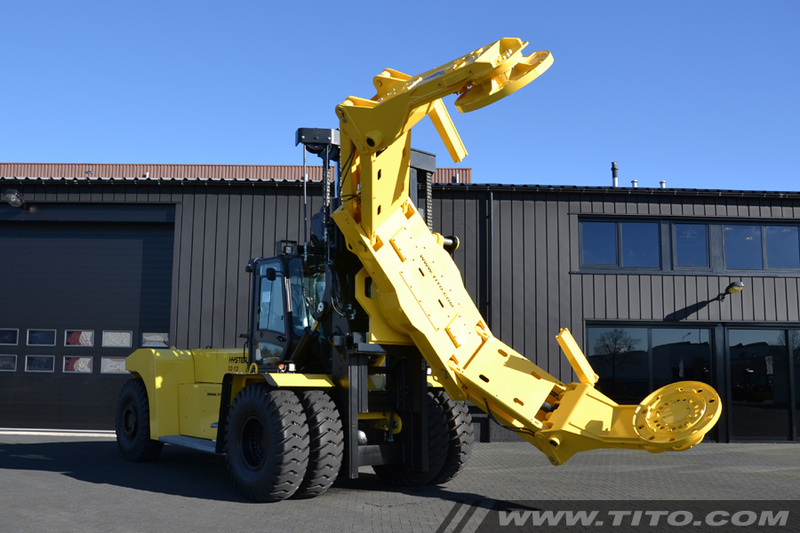 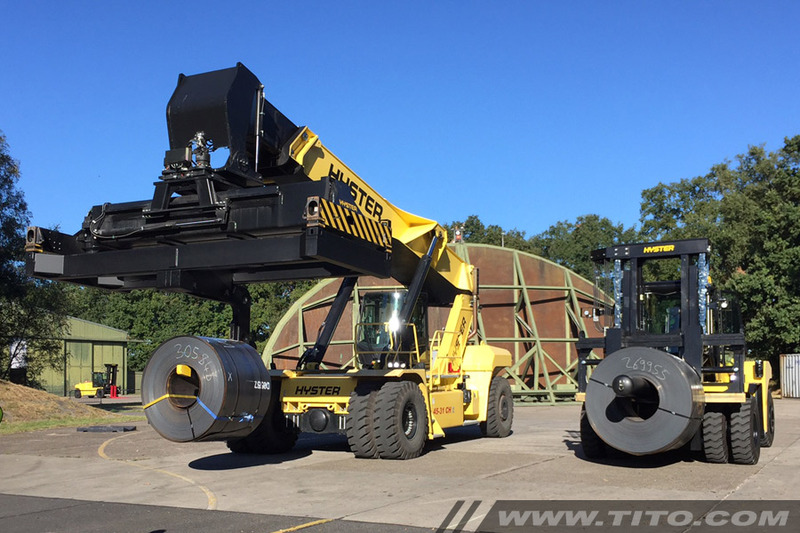 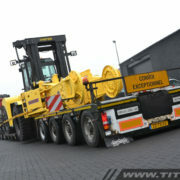 This month we have sold our Hyster Tire Handler to one of our overseas clients. 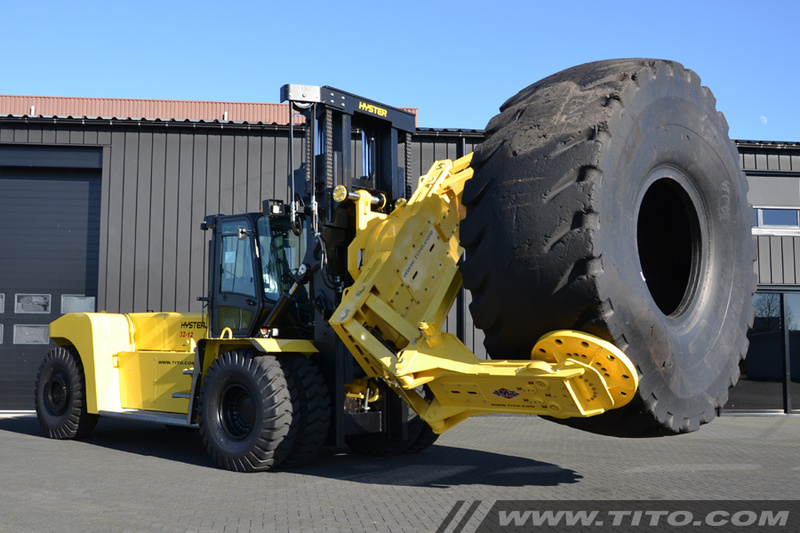 It is a 32 ton Hyster forklift, model H32XM-12 with an IMT TH36K164 tire manipulator. 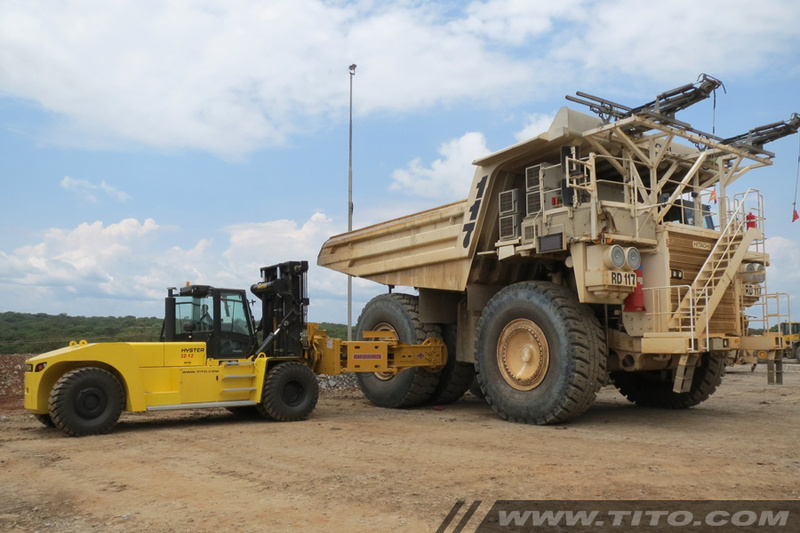 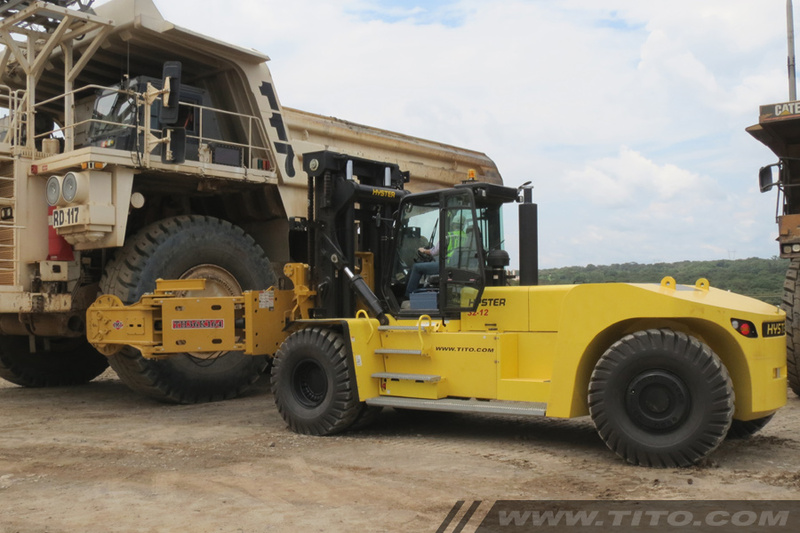 The machine will be used in the workshop of an African mine to change the wheels on the large mining dump trucks (haul truck). 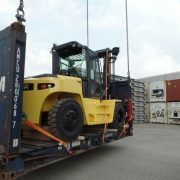 As in most cases, we arrange the sea freight to the nearest sea port of the final destination. 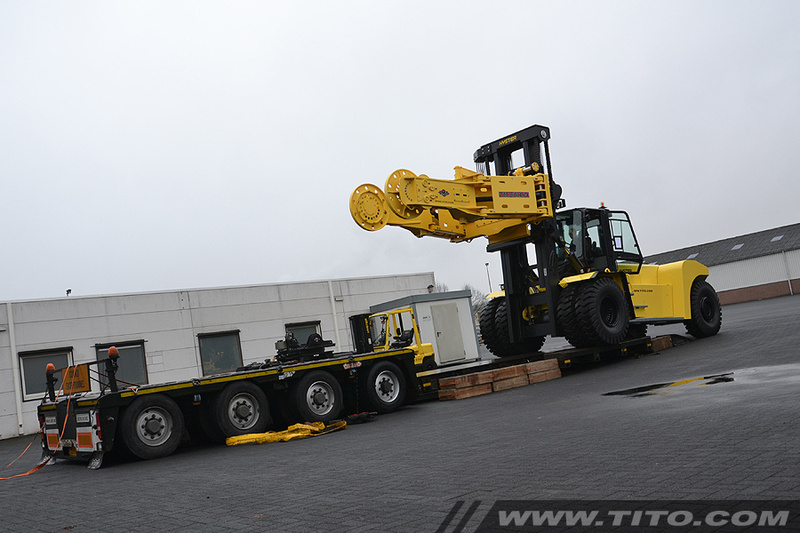 But first we needed to arrange the inland freight from Nijmegen, the Netherlands to the port of Antwerp, Belgium. 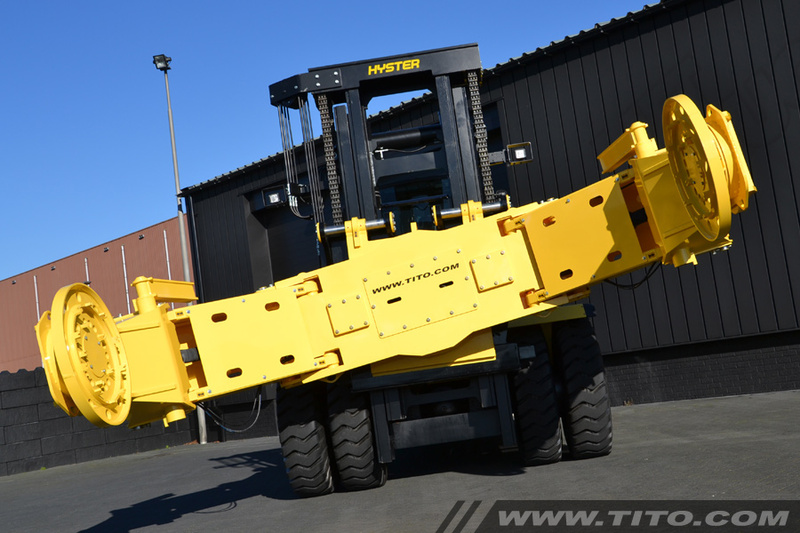 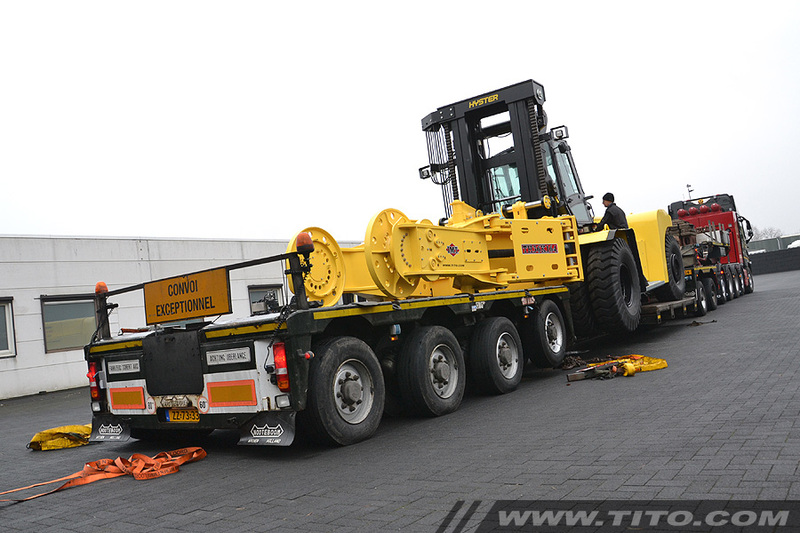 The dimensions of the Tyre Handler are 11.10 x 3.45 x 4.07 m and the total weight is 50.000 kg. 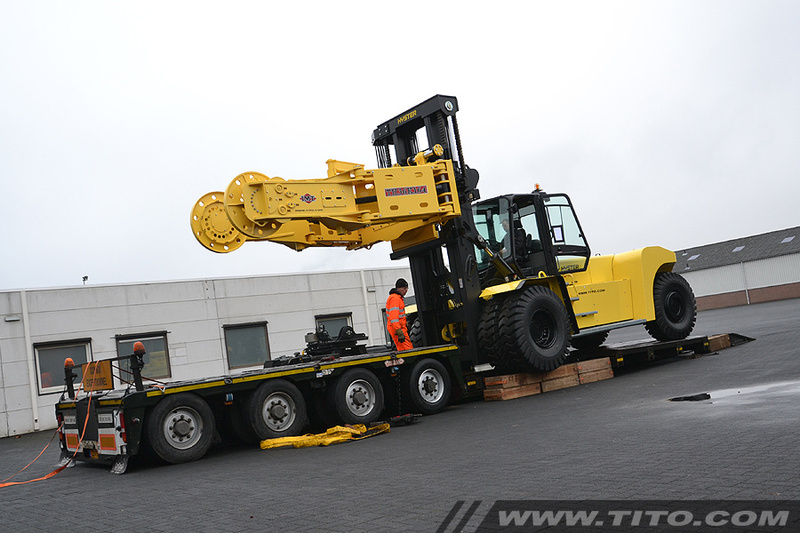 Due to the height of the Tyre Handler, it needed to be transported by a narrow bed low loader. 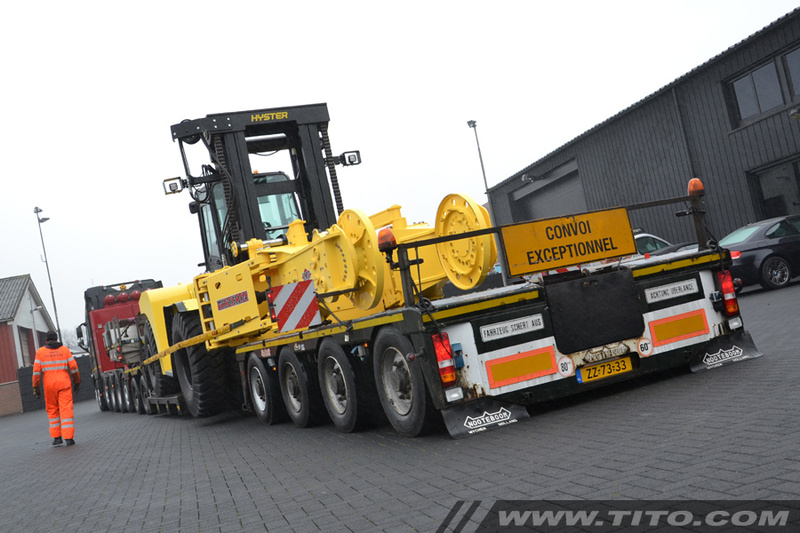 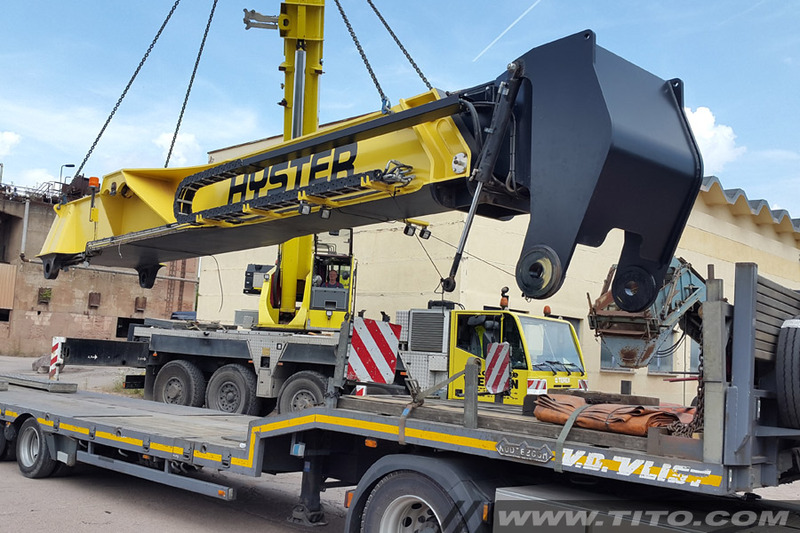 It has been transported by Van Wieren Special BV with a special 4 axle narrow bed low loader. 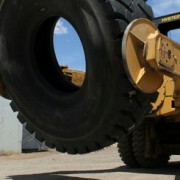 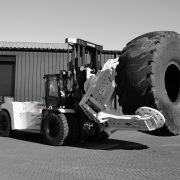 Please do not hesitate to contact us if you are looking for a Tire Handler. 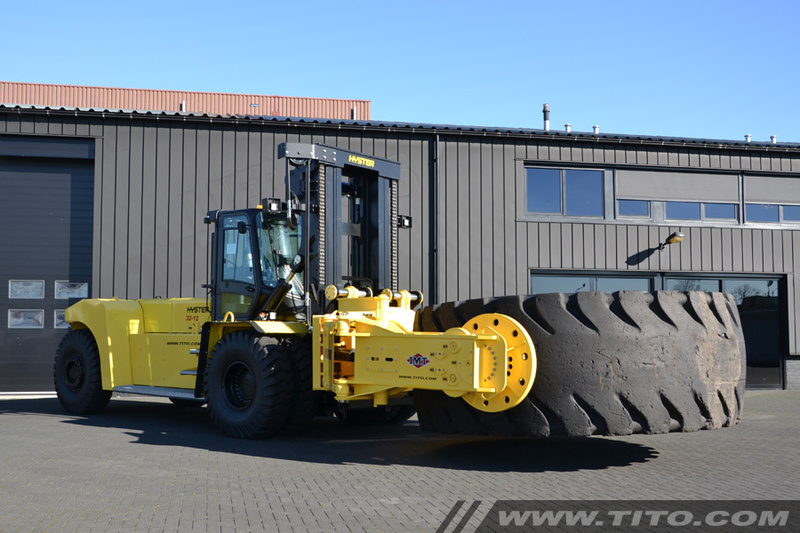 We ship worldwide, assemble our Tire Handlers worldwide and train your local staff as well. 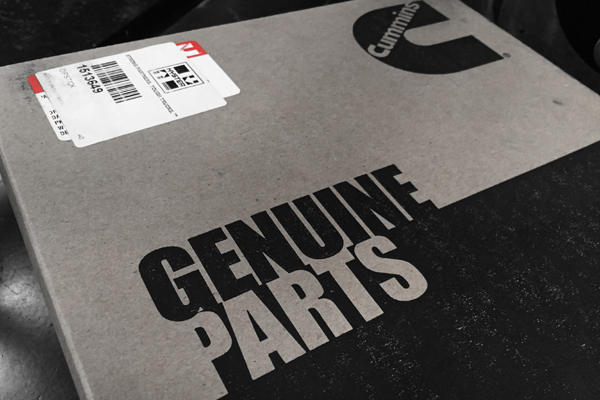 Beside that we supply the spare parts and can return on-site for maintenance or repair. 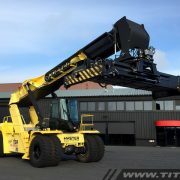 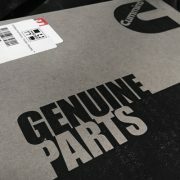 Hyster spare parts for sale in our online shop www.titoparts.com! 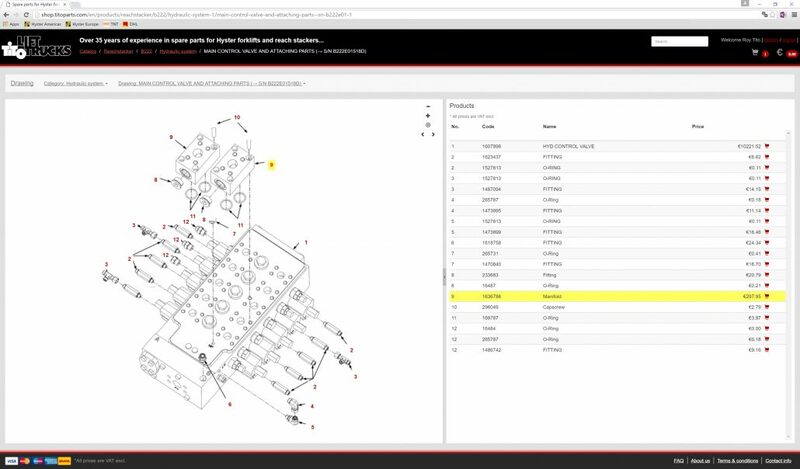 Good news for our clients who don’t have access to a spare parts catalog, we have interactive parts drawings from most of the Hyster big trucks on-line. 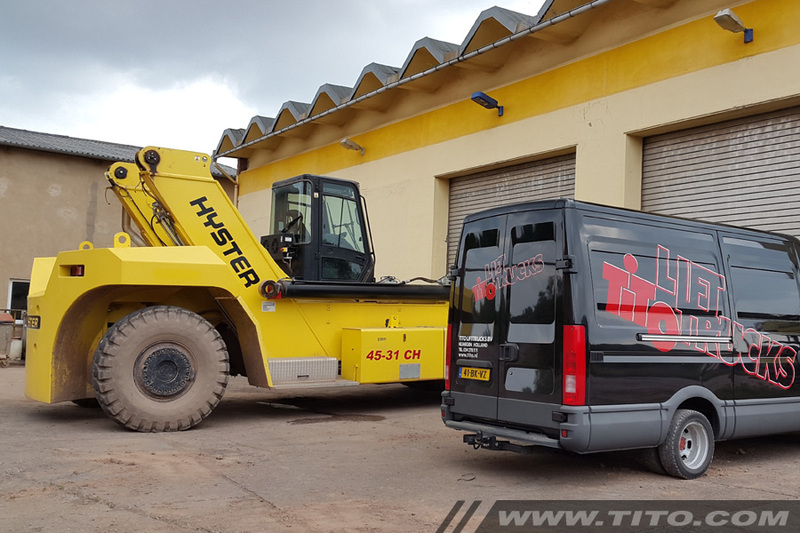 Our delivery times are short, because we are located on a 2 km distance of the Hyster Big Truck factory and their European spare parts warehouse. 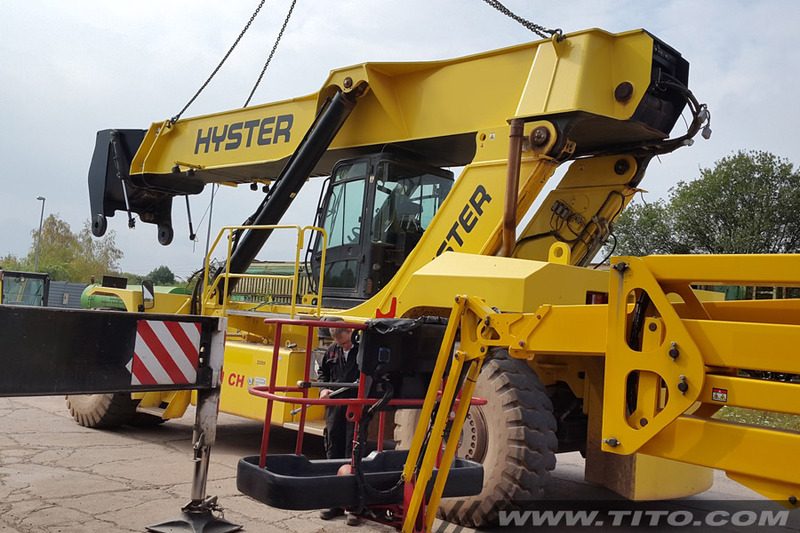 No problem if you are for example located in Nigeria, Kenya, Djibouti, Chile or Colombia. 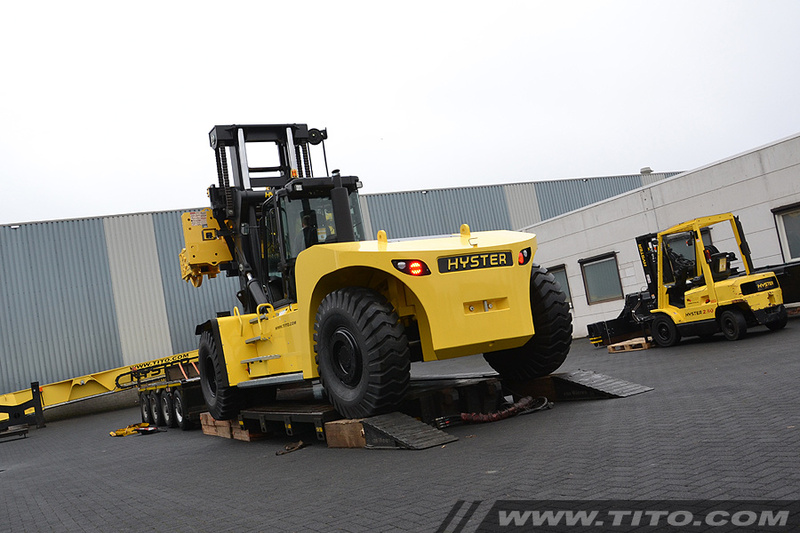 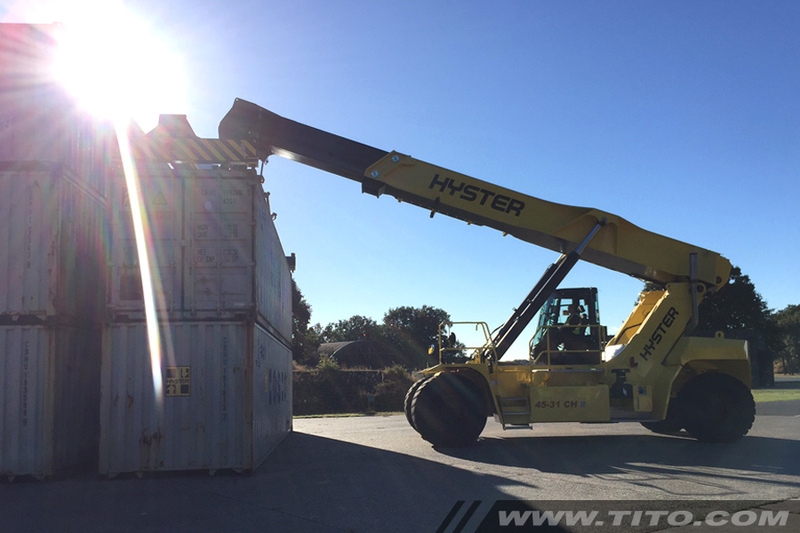 We ship our Hyster parts fast and worldwide by TNT or DHL. 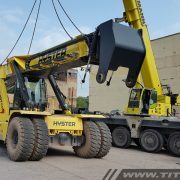 You can easily create an account and just add the required Hyster parts in your shopping basket.